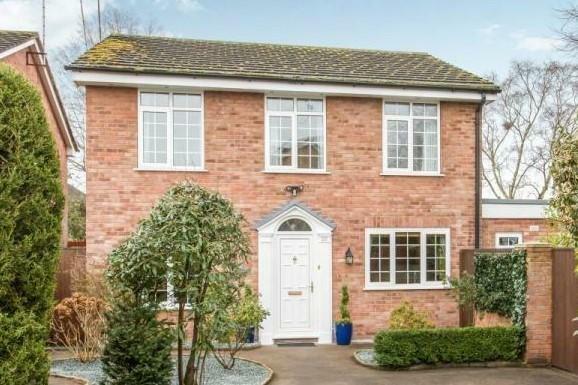 4 Bedroom Detached House For Sale in Nantwich for Offers in the region of £375,000. Looking for an immaculate and spacious home, on a good sized plot, tucked away in a cul de-sac of a popular residential area, within walking distance of Nantwich town centre? Look no further this is it!! Viewing is essential to appreciate the space this detached family home offers. The accommodation in brief comprises of entrance hall, a large lounge which is used a lounge and family room, snug, dining room, breakfast kitchen, utility room and WC to the ground floor. To the first floor, four double bedrooms, three of which have built in wardrobes, the master with large en-suite and a family bathroom. The property benefits from gas fired central heating and double glazing. Externally there is a driveway that leads to a double garage and further parking behind the gate which would be suitable for caravan storage. Delightful gardens front and rear and a lovely patio area to the side. Viewing highly recommended, be quick for this one! Family bathroom, en-suite shower room and WC. Double garage and lots of parking. Coved ceiling. Radiator. Telephone point. Staircase to first floor accommodation. Low level WC. Wall mounted hand basin. Tiled walls. Radiator. Adams style fireplace with marble effect surround and hearth, incorporating living flame coal effect electric fire. Coved ceiling. Two radiators. French door to patio and rear garden, further aspect window to rear garden beyond. TV aerial point. Archway to dining room. Arch to lounge/family room. Four dual aspect windows which include three feature arch windows overlooking patio and rear garden. Coved ceiling. Radiator. Communicating door to the kitchen/breakfast room. Range of fitted wall and base units. Work surfaces incorporating 1.5 bowl sink unit with drainer and mixer tap. Integrated Neff electric cooker and hob. TV aerial point. Aspects to front garden and courtyard. Communicating door to dining room and further communicating door to Utility room. Oak effect fire surround incorporating living flame coal effect electric fire. Radiator. Coved ceiling. TV aerial point. Aspect to front garden. Glow Worm gas fired central heating boiler. Plumbing for washing machine. Tiled walls. Door to side patio. Aspect to rear garden. Three double built-in wardrobes with additional storage cupboards above. Radiator. Telephone point. TV aerial point. Aspect over rear garden. Low level WC. Double shower cubicle. Wash hand basin set into vanity unit. Shaver point. Radiator. Spotlights. Three double built-in wardrobes with integrated storage cupboards above. Radiator. Two windows with aspect to front. Range of built-in wardrobes with integrated storage cupboards above. Radiator. Aspect to front. Shelved storage unit. Radiator. Aspect to side garden. Panelled bath serving hand held shower head with Coram panelled shower screen. Low level WC. Hand basin. Radiator. Linen cupboard incorporating hot water cylinder. Spotlights. Occupying the prime corner plot position with extensive grounds. The property is approached over a tarmacadam driveway with extensive on-site parking facilities. Double entrance gates to the rear courtyard suitable for further parking of several cars or caravan. Detached double garage with electric up and over doors with power point and door to rear courtyard. Courtyard contains raised flower beds, mature borders, greenhouse and two garden sheds. Trellis work divides this area from the side patio which is extensively paved incorporating stocked borders. A picket fence and gate lead to the rear landscaped garden which enjoys a southerly aspect and is not overlooked. The rear garden is principally laid to lawn with a variety of fruit trees and mature stocked borders. There is an outside water tap and three external electric sockets, one to the front and two to the rear. Nantwich is a charming market town set beside the River Weaver with a rich history, a wide range of speciality shops & four supermarkets. In Cheshire, Nantwich is second only to Chester in its wealth of historic buildings. The High Street has many of the town's finest buildings, including the Queen's Aide House and The Crown Hotel built in 1585. With easy access via the A500 to major motorway links.